There was very little that I found entertaining about this film, which is why I have only given it 2 stars. Although the film is critically acclaimed, being shown at both Sundance and Cannes in 2010, there doesn't really seem to be anything here for people who simply want to sit down and enjoy a good film. The film is well written and well directed by Derek Cianfrance, yet still seems to lack purpose somehow. The overwhelming feeling is that you are basically watching two people who are vaguely dissatisfied with the way their lives turned out, hardly the best foundation for a thrilling storyline, and something most of us deal with on a daily basis. Do we need to watch others go through this marriage breakup, and constant bickering? Probably not. The main plus side for this feature would have to be the two stars of the film Ryan Gosling (Fracture, All good Things) and Michelle Williams (Brokeback Mountain), who are both magnificent, offering first class performances and carrying what would otherwise be a fairly tedious production. 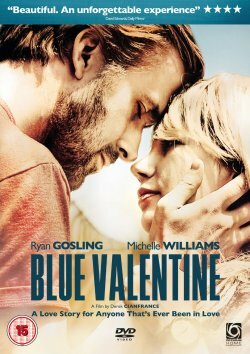 Special features included on the disc are Directors commentary, The Making of Blue Valentine, Deleted Scenes and Home Movies. Generally speaking, I unfortunately did not see the point of sitting watching a 2 hour snapshot of someone else's life, especially since they weren't really doing anything. However, although this wasn't my cup of tea, and probably won't be a lot of other peoples either, there has been a lot of positive hype about it too, and I'm sure it's worth a look if you like that kind of thing.